I'm sorry. Even though we don't own a dog, apparently it ate my homework. Not really. 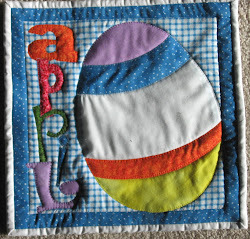 The Farmer's Granddaughter Quilt Along Fruit Basket block from our Forum group at the Missouri Star Quilt Company's website is late being presented because of too many excuses. If you do not tolerate excuses, you probably would be much happier skipping the next few paragraphs. 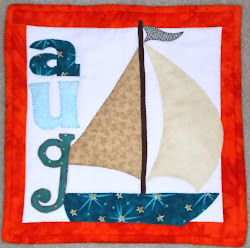 The first excuse is that the first time I sewed the block, I discovered afterwards that templates #46 and #46R did not print out lengthwise correctly on my printer. The second excuse is that when I enthusiastically cleaned up the SD card in my camera on the car ride to a family wedding, I accidentally deleted all my photos of the Fruit Basket block. The third excuse is said out-of-town family wedding. Here is an example of the fourth excuse, or how we spent our free time on the said family wedding trip. My husband (aka IT Prof) is goofing with our younger daughter (aka Swan) by reading her a children's version of The Wizard of Oz as a "bedtime story" when we were at IT Prof's mother's house for the family wedding. Swan lives in Minneapolis, so we do not get to see her much. Hence, we try to make the most of our time together and usually end up being silly (or at least what we think is silly). 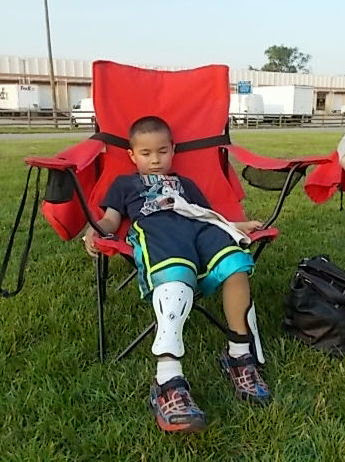 Our older daughter's son, Omaha, failed to realize that Grandpa's reading of the book was a joke when he walked in the bedroom, so all of a sudden reading The Wizard of Oz became a serious endeavor in order not to disappoint Omaha. 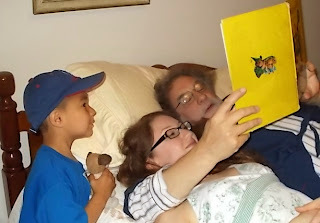 After all, from Omaha's perspective, it makes perfect sense for Grandpa to read a book to Aunt Swan. The fifth excuse is Omaha. He does not go to daycare in the summer, so IT Prof and I have opportunities to see him more often. For example, we've been driving to the opposite side of the metropolitan area a lot lately to do things with Omaha. (That is a good comment, not a travel complaint.) When we attended soccer camp practice, the coach wore Omaha out. Our daughter probably appreciated that. However, excuses are just that. 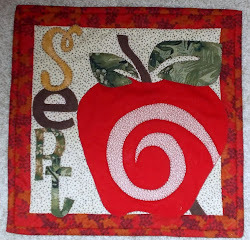 I apologize to all my quilting friends for delaying the presentation for the Fruit Basket block, especially since one of the templates you have might be wrong. For those of you who know me, you realize that I was disappointed to realize that the Fruit Basket block is essentially a 25-patch. 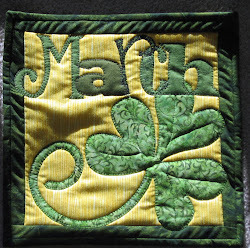 How do we measure out 1.2 inches exactly with our quilting rulers? We don't. So, I actually intended to use the templates again for this block. Of course, my templates #46 and #46R being too short did not help. However, you can easily make new templates with template #34. 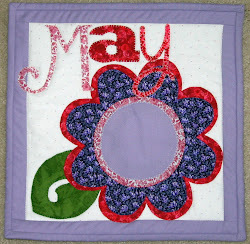 In order to make templates of the correct length, copy your template #34 and draw lines 1/4" inside each of the sides. These lines mark the the seam allowances, so the inner square is the size of the finished square. Trace a copy of this inner square four times. Line these four squares up on another piece of paper and tape or glue them down. 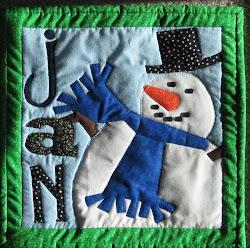 Make a second row of four squares and tape or glue them down. Next, draw a diagonal (in different directions) on one end of each line of squares. This should end up giving you one trapezoid that looks like template #46 and one trapezoid that looks like template #46R. 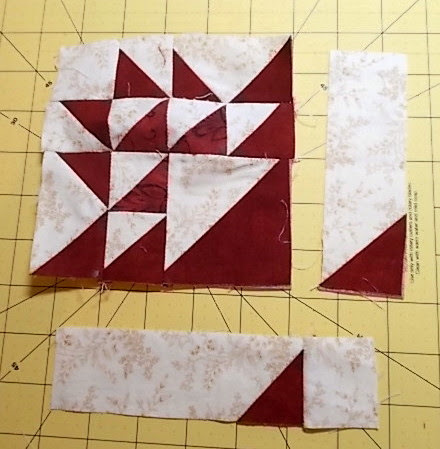 But, before you cut anything out, please remember to draw a 1/4" seam allowance on each side of each trapezoid. Then you can cut the trapezoids with added seam allowances out for your patterns. If my explanation is unclear, please contact me and I will try to do a better job. Light fabric: one piece from the new template #46; one piece from the new template #46R; seven pieces from template #38; one piece from template #47; and two pieces from template #34. 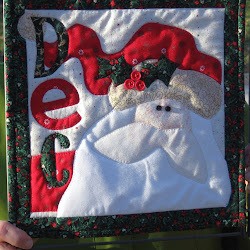 Medium fabric: three pieces from template #38. 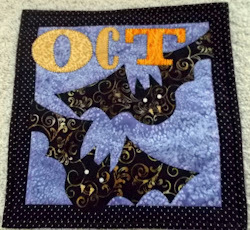 Dark fabric: one piece from template #33 and ten pieces from template #38. Since I'm me, I feared sewing the triangles correctly, so most of the time I did use the HST method. In order to get my trimmed HSTs to the right length, I used template #34 as a pattern for the unfinished HSTs I used in the modified 25-patch. Below is my slightly-altered-from-what-you-would-use-with-the templates layout. 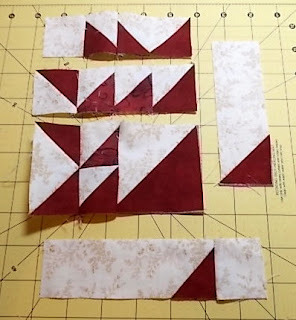 The medium and dark pieces are ironed in half along the diagonal. That's why the big cream square looks wrong. 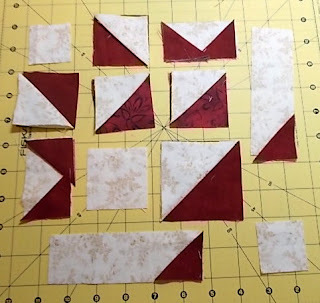 I only needed two squares of the medium fabric (because the HST method yields to HSTs from two squares), but the layout really needed another square of the medium fabric ironed in half along the diagonal to be perfect. I also found that keeping all the pieces laid out next to my sewing machine really helped me keep all the different triangles oriented in the correct directions. Please remember that I used my template #34 to trim my HSTs to the correct size. 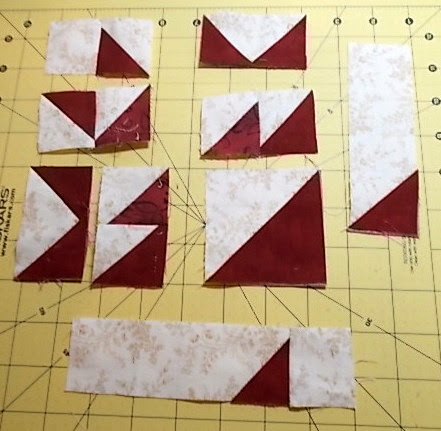 I sewed along the diagonal on my red squares for the two flying geese units instead of sewing 1/4" on each side of the diagonal for the HSTs. 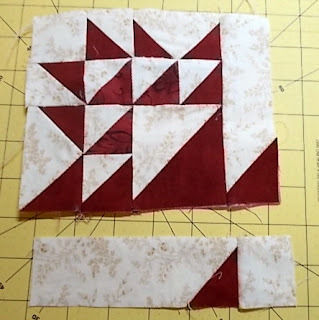 I used two light rectangles from I made from template #34 and a dark red square from template #34 (ironed in half along the diagonal and sewn along the diagonal) on the right-hand and bottom edges. If my method has not confused you yet, please be careful to align the diagonals of the dark red squares in different directions on the end of the rectangle. And, surprise! I actually used template #33 for the two pieces to make the larger HST. The photo below shows what my layout looked like after I trimmed all those HSTs, etc. 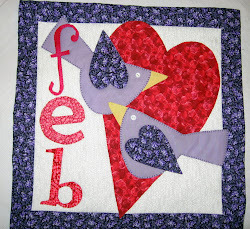 and sewed most of the HSTs or flying geese in pairs. 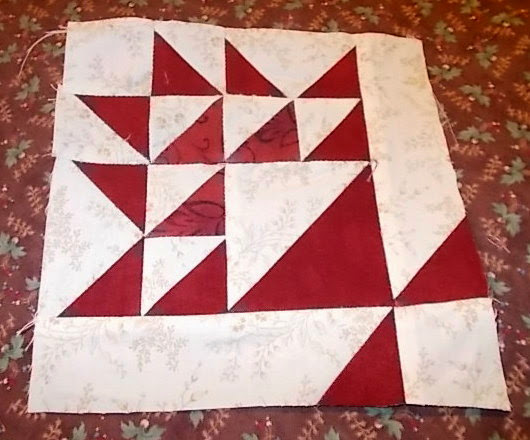 I also sewed the bottom right-hand-square to the bottom row trapezoid and triangle. Here is what my layout looked like after I sewed the first row (except the right-hand-side) together, the second row (except the right-hand-side), and the combined third and fourth rows together (except for the right-hand-side). 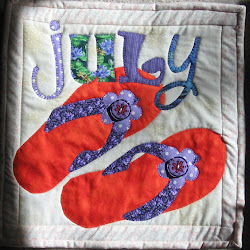 Then I sewed the upper rows on the left-hand-side together. Next I sewed the right-hand-side of the top part of the block to the big square in the upper left-hand part. 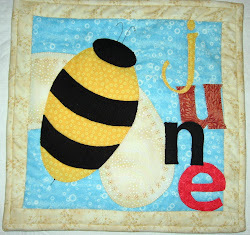 All the block needed at this point was for the bottom row to be sewed on.